The pervasive use of antidepressant medications has provided mixed results with efficacy of far lower than originally described. Only about 54 percent of depressed patients show substantial clinical improvements when they take their medicines as prescribed, and of those people, two-thirds continue to experience residual symptoms that interfere with their ability to function. The placebo response rate is about 40% and has continued to increase over the years. Medical professionals used to believe that depression was the result of certain thoughts or triggers, but recent research indicates that depression is rarely due to a single cause. Depression is more likely a combination of biochemical, physical, genetic, and psychological factors. Physicians tend not to assess mental health in terms of nutrition, largely due to inadequate training in nutrition in medical school, according to a study conducted by the National Academy of Sciences. A follow-up survey conducted in 2006 confirmed the notion that physicians lacked the training to understand the importance of nutrition in order to better counsel their patients. This comprehensive textbook includes contributions from over 2 dozen experts in the field of integrative medicine. 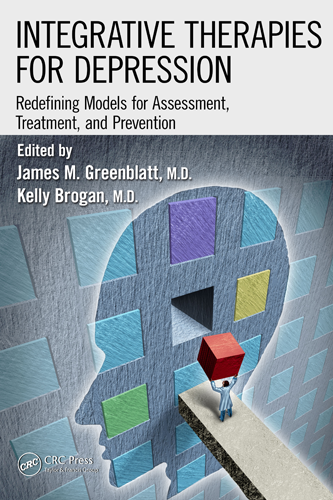 This book will review the current treatment models utilized in the treatment of depression and present scientific based evidence research to support integrative medicine for depression with practical clinical recommendations. The text will also describe concepts of inflammation, hormonal imbalances, gastrointestinal problems, and nutritional deficiencies as potential underlying metabolic causes of depression. Other treatment options include nutritional interventions and evidence-based lifestyle medicine including the role of sleep, exercise, and stress reduction techniques.